Valentine My Funny is an audiovisual performing piece. 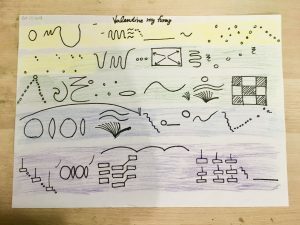 In this piece, Maxwell and I combined both physical objects and MAX in order to accompany the musical piece Valentine My Funny, by F.S. Blumm and Nils Frahm. Maxwell and I did a realtime audiovisual performance to Valentine My Funny, by F.S. Blumm and Nils Frahm. 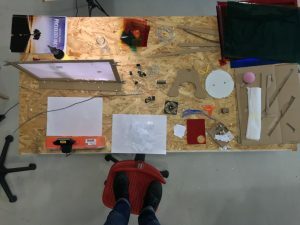 Through the combination of material objects and MAX, we created an abstract performance to visually accompany the music piece. We created a stage made out of a sheet of paper and cardboard. Then, we projected light onto the paper and moved objects around the space and record the projections of the stage with a webcam. This feed was then modified in MAX and projected for the audience to watch. 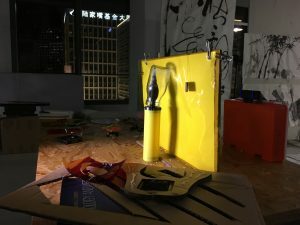 For us, this piece was more about experimenting with physical objects as a way to create abstraction that would fit the musical piece, rather than expressing a particular concept. Maxwell had previously done a dance piece to this song, so he suggested it and we both agreed this was the right piece for our performance. It is a very sparse song, which means that this would also make the audience focus more the visually aspect of the performance. So we just got inspired by the song to create certain movements with the objects and were looking for abstraction. We were also looking to create some of the visual styles that some early light artists used, such as Oskar Fischinger’s work. We were very interested in the earlier experimentations of abstract films done by artists such as Oskar Fischinger (Komposition in Blau) and Walther Ruttmann (Lichtspiel: Opus II). Thus, I would say that our performance fits with their projects. 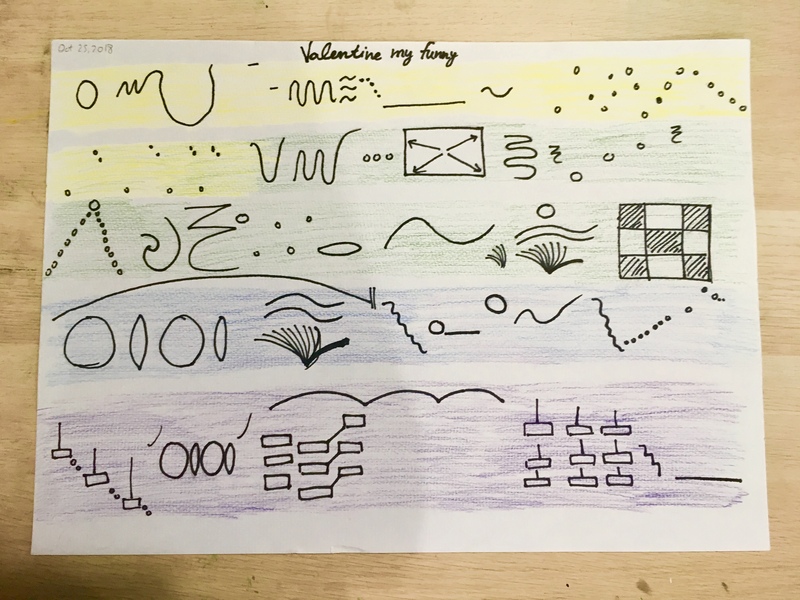 We tried to make the visuals accompany the music piece, as Oskar Fischinger did, and tried to represent the movements that Walter Ruttmann made. Overall, Maxwell and I were focusing more on the material side of it, rather than on the technological side of it. Thus, we fit more with earlier works which did not really on technology very heavily. 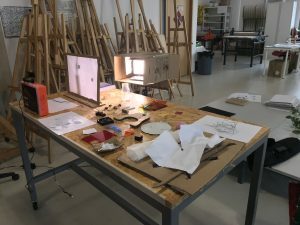 Materials: bottle of water, thread, light gels, cardboard, paper, paper clips, glue gun, cutter, glass container, balloon inflator, book, spotlight, cardboard box, tripod, webcam and other small objects. We started by creating the stage. To make the stage, we used cardboard, which kept the paper still, and attached the paper with clips. 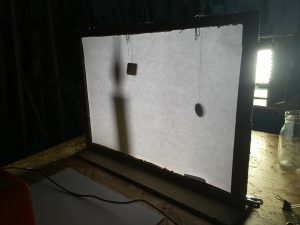 Then we set up the light, which projected behind the paper, allowing the webcam on the other side to record the shadows. 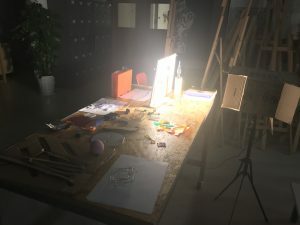 So we started collecting a variety of different objects that produced interesting shapes and shadows, and used light gels in order to change the background color. We also modified some of the objects to make them easier to use, such as adding thread or cutting cardboard and some light gels to create patterns and shapes. Once we had some ideas for the performance with the objects, we started creating the MAX patch. We also wanted to keep this simple, but at the same time make the performance a bit more visually stimulating. Thus we modified the brightness, hue and saturation of the feed and added continuous rotation to the video to make it less static. Our performance went very well. I actually think it was one of the best versions of our performance. Although I was quite nervous before we started, I think we did a pretty nice job performing our piece and luckily, it all worked together. I think what worked really well is having one person taking care of the ‘stage’ and the other one taking care of the software. In this case, Maxwell was mainly with the physical objects and I was with MAX. Although I helped Maxwell in several occasions throughout the piece, I think that assigning one person to be paying attention to the software is very important. For instance, there was a moment where the screen went completely red when switching between different light gels, which I was not expecting. But since I was in charge of making sure that the MAX part of the project was going alright, I quickly tried to fix it. But there is always room for improvement and maybe we could have practiced a bit more. For instance, I would have liked to control MAX better when switching the light gels because sometimes the effects would go crazy and would show as either overexposed or underexposed. After watching the recording of our performance, I felt that we were actually quite successful at creating this experience. Although this was not our intention, I think the performance was magical in a way and that it was successful at changing the atmosphere. But I am really happy with the way our performance turned out. Out Graphical Score mostly represents the musical movements of the song. However, some parts do represent the objects or shapes we do, such as the book ( in the end of the third line) and the circle-semicircle-circle-semicircle. We also divided the song into different colors, which do not exactly match those that we used for the light gels. This was useful when thinking of the different stages of the song and the development throughout. Since our performance depends heavily on the material objects, we always modify some parts as we are performing, depending on how long it takes us to do a certain movement. So our graphical score is a guideline for us to follow the piece, but we do not let it limit us when performing. Overall, I am very happy with our project. I got much comfortable with using Max (also because of Eric’s help) and now I feel like I can use MAX much better and I am not as afraid to experiment with it. I also noticed that my laptop gets very ‘overwhelmed’ whenever I start doing more complex things in MAX, which I find very annoying and wish this problem could be fixed. I think we could have controlled MAX a little bit better so that the output is always clear to see. But I am very happy with our performance. I think we did a great job and this project definitely inspires me to keep trying different methods of performing realtime audiovisual pieces.